There may be a sense of frustration and concern regarding ongoing construction of Metro’s Silver Line, area elected officials said Thursday, but its great potential must be remembered. Fairfax County Supervisor Cathy Hudgins and state delegates Ken Plum (D-Fairfax) and Jennifer Boysko (D-Fairfax/Loudoun) talked about Metro and the surrounding future development during a legislative panel discussion sponsored by the Greater Reston Chamber of Commerce and hosted by Dominion Virginia Power in Herndon. Plum, the former state chair of the Dulles Corridor Rail Association, said it is important to put the status of Metro’s Silver Line in perspective. A large amount of development has happened or is in the works in the area of the Wiehle-Reston East Metro station, the current western terminus of the Silver Line. Other projects are also springing up near the line’s future stations in Fairfax and Loudoun counties. The Metro Washington Airport Authority’s Dulles Corridor Metrorail Project, which is overseeing construction, announced recently that Phase 2 work to extend Metro through Reston into Dulles Airport and onward to Ashburn is more than 56 percent complete. However, deficiencies in Metro’s budget and decreasing ridership have raised a number of questions in recent months about the future viability of the transit system. Boysko, whose district includes Herndon, praised the state’s creation of the Metrorail Safety Commission to examine how Metro is being organized and managed. She said as Phase 2 of the project continues, it is imperative that safety issues as well as financial and operational performance are properly monitored and addressed. Hudgins, who is also a member of Metro’s Board of Directors, said this is a conversation she “live[s] every day.” She said Metro is unique in many ways, most notably in its partnership between multiple jurisdictions as well as in its infrastructure itself. Plum said Metro needs to be revitalized, and in order for that to happen, it needs to continue to receive the support of the surrounding community. 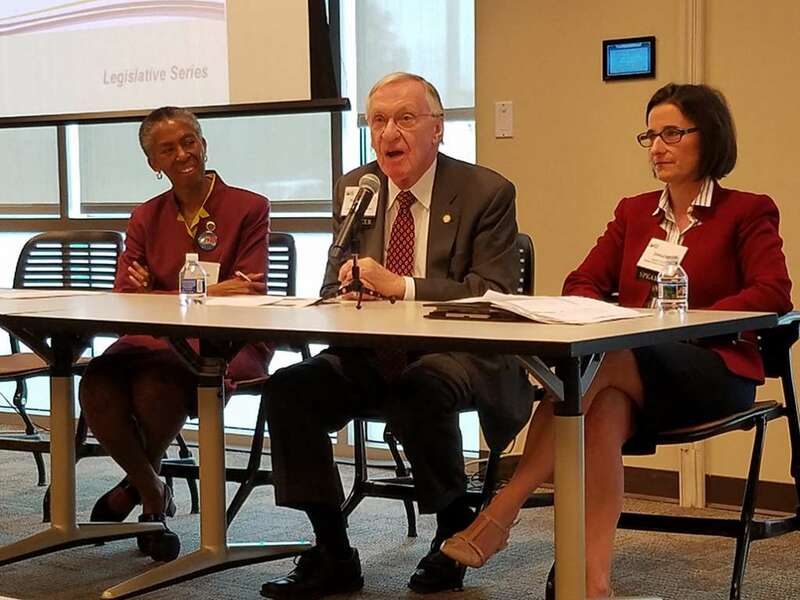 The legislative recap event sponsored by the Greater Reston Chamber of Commerce is a chance for local businesspeople to keep abreast of important issues in the community, said Mark Ingrao, GRCC president and CEO.